When you decide to start a training program, your expectations are very high. You want competent people, who understand your needs, and are familiar with the business environment in general. You want trainers who are able to answer all your questions. Who can engage in constructive dialogues during the programs. You want more than a simple trainer. That’s exactly what the Interact trainers are like! They have business experience gained by working for many years for and with important organizations. They have extensive experience in training, certified by numerous accreditations from Interact’s external partners. Besides these important advantages, Interact trainers are characterized by a very important differentiator: empathy. Which means they understand you and your colleagues. Starting from here, they will adapt Interact’s programs to your specific. Meaning that you’ll receive exactly the training program you need. Now it’s your turn. Evaluate. Think carefully. Wouldn’t you benefit from collaborating with such a team? 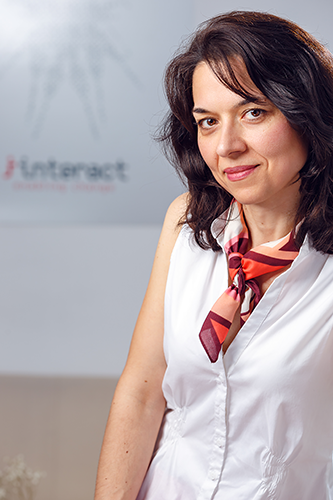 Georgeta Dendrino is the Managing Director of Interact and has more than 21 years of experience in the field of training and consultancy and more than 10 years in coaching with clients across all the major industries and different countries. She has developed and delivered training programs for managerial teams from top to middle management and has been a team leader in various consultancy projects. She has developed various business simulations and teambuilding programs, working with major industries such as banks, construction, pharmaceutical, manufacturing, retail, FMCG and oil. 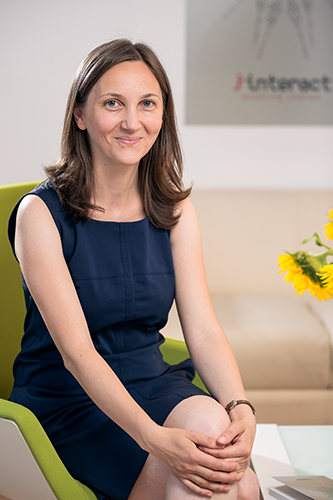 Georgeta is a member of the board of AVE (Association for Values in Education), AMCOR (Romanian Management Consultancies Association), a member of the Romanian Human Resources Club, Romanian Business Leaders and Professional Women Network. Education and Acquired Trainings: Executive Master in Coaching and Consulting for Change, Insead, April 2014 – May 2016; The Challenge of Leadership, Insead, January – December 2013; Executive MBA, Asebuss and Kennessaw State University, Atlanta, USA, 2007; Human Resources Management Certificate of Seneca College, Toronto Business Administration and Marketing Courses, Seneca College, Toronto, Canada Professional Certificate in Management, The Open University, UK, (CODECS), 1998 – 2000; BA, Bucharest University, Foreign Languages Faculty, 1992. 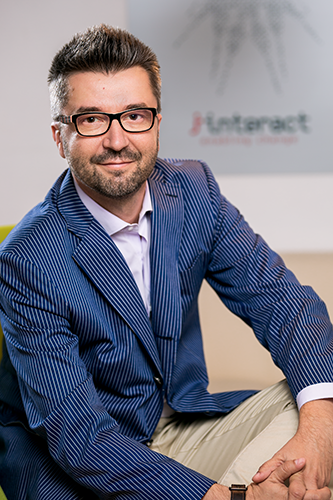 Lucian Mihai is Partner at Interact Business Communicatons Romania. He has gained managerial experience in the domain of professional services and sales management, as well as IT distribution. Lucian is a trainer and a consultant within the Interact Development Department. Lucian’s functional experience is related to three areas: management in professional services, training and sales and acquisitions. Lucian has been a member of the management team since 2004 and became managing partner in 2007. 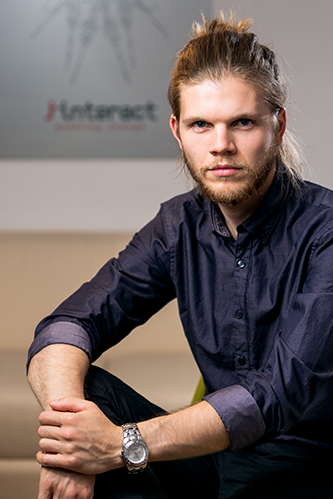 Together with the management team of Interact, Lucian has helped turning Interact into one of the first five players in the training industry based on the turnover and notoriety. Regarding the training field, Lucian has gained extensive experience in different industries in a few key areas: management, especially people management, business communication and relationships. Lucian has several international accreditations, besides being a Master Trainer in the international network Think on Your Feet®. 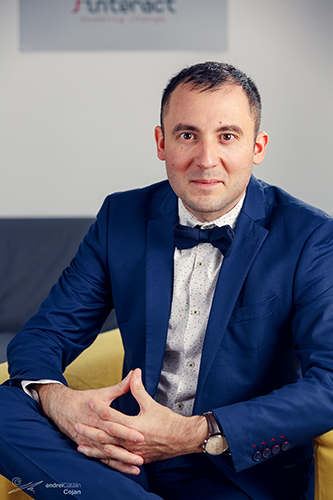 His experience in the management field as well as sales and acquisitions is related to the IT industry- distribution of computer components -where Lucian held the position of Sales Manager and Purchasing Manager. Lucian managed the international purchasing subsidiary of this company in China for one year. The multicultural area and its impact on communication, management and leaderhip is one in which Lucian has put a lot of passion and effort. He has delivered consultancy and training programs in Austria, Bulgaria, Croatia, France, Hungary, Portugal and Turkey. Lucian Mihai was elected "Trainer of the year for 2008" in Romania. Education and Acquired Trainings: BA Foreign Languages, University of Bucharest; Master Trainer Think on Your Feet®, Advanced Trainer Emergentics®, Visual Facilitation, Improvisation and Story Telling, Unleash The Power Within, Needs Analysis, Instructional Design, IoweU©, The Skilled Presenter™, Coaching to Success, The Art and Science of Feedback©. 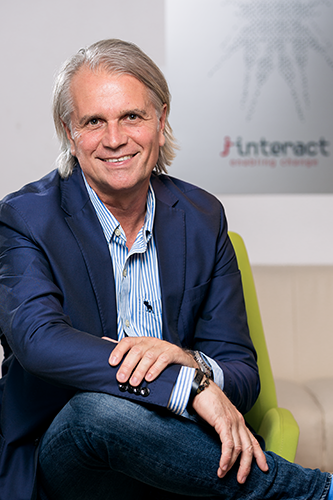 Dan Marinescu is Managing Partner at Interact. He is Financial and Logistics Department Manager. His activity is oriented towards implementing and improving the financial indicators and optimizing the company's logistic flows. Education: Executive MBA, Academy of Economic Studies and Le Conservatoire des Arts et Métiers, Paris, 2006-2008; Business Administration, Seneca College, 2005; Faculty of Management and Marketing, Romanian-American University of Bucharest; Financial Management, Codecs, 2003. Education and Acquired Trainings: Emotional Intelligence, Improvisation and Story Telling, Unleash The Power Within, Leadership for Managers, NEWS Experience, Giving and Receiving Feedback, Project Management, Consumer Marketing, Fundementals of Structural Thinking, Aligning Company and Individual Performance, Factory - Team Training International. Alina’s expertise includes communication solutions, presentation skills, team effectiveness, train the trainer and organisational culture. For the past 11 years, she has been delivering Interact solutions to clients from IT&C, banking, FMCG, energy and pharma. 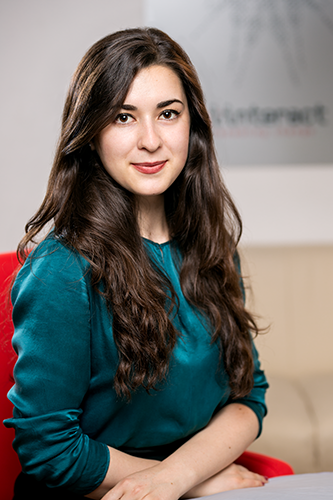 Alina is involved in various organizational development projects, with an active role in needs analysis, program design and delivery, account management and product development. Her experience ranges from working with one-to-one solutions to groups of up to 170. She is a member of the teaching staff of IAA’s Marcomm School, where she has been teaching the presentations module since 2008. Aura is specialized in delivering general and business French and Romanian courses for all levels tailored to the needs of professionals working in various industries. She focuses on helping her clients achieve their objectives while having an engaging learning experience. She is also a certified examiner with the French Institute in Bucharest. In addition, she has done interpreting for business workshops, translated training materials, user manuals, and films for various French Film Festivals. Education and Acquired Trainings:Master’s in teaching French as a second language (Master 1 FLE), Rouen University, France; Bachelor Degree in Foreign Languages, University of Bucharest. Instructional Design 4MAT4BUSINESS; Visual Facilitation; Improvisation and Story Telling; Presentation, Reasoning and Show; Facilitation skills©; Managing Business Today™;Giving & receiving feedback; Customer Centric Behaviour©; Professional Services Today™ (Business Today International); Introduction to Coaching Abilities; Consumer Marketing Today™. 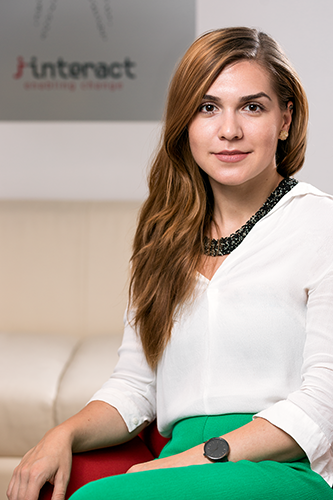 Oana has been a trainer within the Interact Communication Department since 2008 and is fluent in English and Spanish. She proves great capability to empathize with people and is constantly focused on designing her language training agendas following creative and inspirational patterns. Education and Acquired Training: 2007- M.A. in English Applied Linguistics at the University of Bucharest, 2006- B.A. in English and Spanish at the Faculty of Foreign Languages and Literatures, University of Bucharest. Visual Facilitation, Improvisation and Story Telling, Presentation, Reasoning and Show, Facilitation skills©, Managing Business Today™, Giving & receiving feedback, Customer Centric Behaviour©, Professional Services Today™ (Business Today International), Who moved my cheese?©, Introduction to Coaching Abilities, Consumer Marketing Today™, Train the Trainers©, Time Management, Skilled Presenter, TalkWorks at Work. 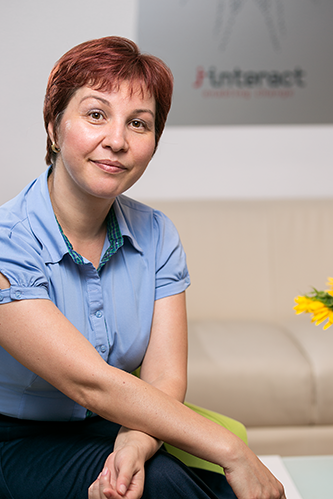 Miruna Neacșu is a trainer at Interact with a recent degree in psychology. She has 3 years' experience as a volunteer in the Psychology and Educational Sciences Students' Association in which she planned and implemented educational projects, developed learning programmes for future project coordinators, whose activity she later guided. Being at the beginning of her professional career she approaches her activity with curiosity and a constant willingness to learn. Public speaking, Teamwork, Advertising for beginners, Situational Leadership, Employee Branding (HR School), Giving and receiving feedback, Art Therapy, Social efficiency, Time & task management. Ramona is a trainer within the Communication department and has nine years experience in designing and delivering Business German and Business English training sessions to clients from various industries. Education: MBA in Entrepreneurial and Innovation Management, Academy of Economic Studies Bucharest and Westfälische Hochschule, Bucharest, 2014, BA in German and British Studies, Alexandru Ioan Cuza University, Iasi, 2004. Instructional Design, Improvisation and Story Telling, Presentation Skills, Facilitation skills, Giving & receiving feedback, Managing Business Today™, Consumer Marketing Today™, Professional Services Today™, Customer Centric Behaviour, Introduction to Coaching Abilities, Train the Trainers, Time Management, Skilled Presenter™, Think on Your Feet®, TalkWorks at Work, Project Management, Change Management, Process Communication Model, Emotional Intelligence, Visual Facilitation. Simona is a trainer within the Communication department. She has a two years experience in teaching French and Romanian to foreigners. She focuses on making her courses interactive and practically useful. She worked as a copyright assistant for one of the most important publishing houses in Romania. She is also a translator for some cultural magazines. Alexandra is a trainer within the Communication department. She has experience in teaching general and business English and German courses. She focuses on designing her courses in a straightforward and interesting manner. BA in German and English at the Faculty of Foreign Languages and Literatures, University of Bucharest, 2015; DAAD scholarship at University of Cologne, 2016; MA in German and English at the Faculty of Foreign Languages and Literatures, University of Bucharest, 2017. Oana is a trainer within the Communication department, with an extensive experience of teaching business and general English to adults from diverse professional backgrounds. She is committed to helping her students broaden their English skills while creating a warm and encouraging environment for learning. She has also translated numerous English and French documents, from soft skills coursebooks to technical user manuals and telecom, IT or financial documents. Bachelor Degree in Foreign Languages, University of Bucharest, Business English Communication Skills, Train of Trainers, Presentation skills, Stress Management. 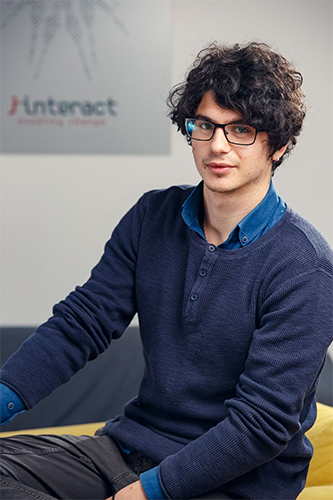 Ion Botezatu is a trainee at Interact and the newest member of the team. He has a degree in psychology and is currently specializing in the field of personal development involving nonformal education for adults, career counseling and psychotherapy. In his four year experience in student volunteering, Ion has organized and coordinated several personal development projects, both local and national, and he is currently looking at how to bring education closer to adults and how to help them to learn better and more enjoyable. Education and Acquired Trainings:Bachelor Degree in Psychology, Faculty of psychology and educational sciences, University of Bucharest. Bogdan has 13 years experience in training and facilitation. He brings a new energy and perspective on facilitation by combining with creativity the passion for individuals and team development and improvisational theatre. He loves using theatre and improvisation activities because they help the participants relax and enables them to try new behaviours without the risk of failing or mistake. He delivers workshops on communication solutions, Storytelling, Sales, Innovation and creativity, Teamwork, Advanced train the trainer, Facilitation skills and Change. He worked both as an internal trainer for Pepsi, BoomTV, Biblionet and Apple, but also as a consultant for companies from IT&C, Banking, FMCG, BPO and Pharma. Education and Acquired Trainings:Psychology and Sciences of Education: Adult Education; Applied Improvisation in Business; NLP Master Practioner; Certified Human Synergistics consultant; Certified Apple Sales Trainer; Storytelling; High Impact Training Skills; Coaching at the Identity Level. Vlad Marinescu is a Marketing Adviser at Interact and has joined the team in May 2016. His activity within the Interact Development Department is oriented towards several projects regarding the company's communication strategy. He is focusing on delivering the right informations Interact's clients need in order to be in touch with the company's values, current projects and future plans. Nontheless, Vlad is an enthusiastic one which can be described by his curiosity and a certain level of commitment to his projects. Education and Acquired Trainings: Degree in Marketing at the Faculty of Marketing, The Bucharest University of Economic Studies. 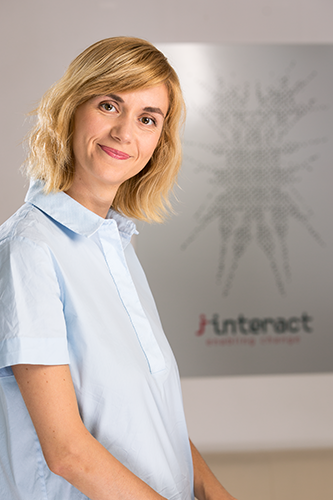 Emilia joined the Interact team in June 2008 working as an Assistant Manager in the Administrative-Logistics Department. Her interests are oriented towards the logistic organization and secretarial activities. Emilia worked for 6 years in the banking sector where self development was possible both personally and professionally, and in particular acquiring expertise in Customer Care. Education and Acquired Trainings: Master in Management and Marketing Organization - Strategic Management, Romanian-American University Bucharest 2014; Management and Marketing, Romanian-American University Bucharest 2011; Presentation, Reasoning and Show, Managing Business Today, Giving and Receiving Feedback, Professional Services Today, Consumer MarketingToday, Fundementals of Structural Thinking, Customer Centric Behaviour, Time Management. Sales, Techniques of Banking Products, Presentation Skills.